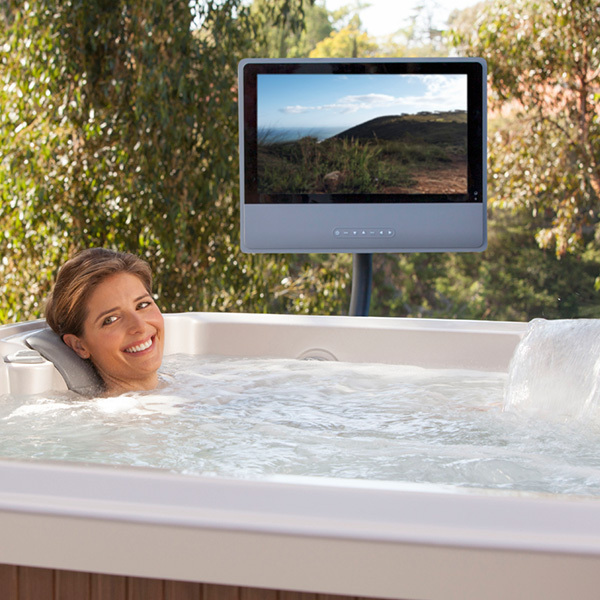 Enjoy live TV, stream video and more from inside your spa or while entertaining in your backyard. The optional all-weather 22” HD Wireless Monitor features excellent picture quality with 1080P screen resolution and anti-reflective, anti-glare coating. A monitor pedestal (or TV stand) that slides under the base of the spa is included for easy mounting and installation. With HDMI convenience, you can add a streaming stick or connect to any of your in-home video sources for a range of programming options. A robust, sturdy frame and tempered glass coating make this LCD monitor ideal for outdoor use. A heavy-grade vinyl monitor cover (sold separately) offers additional protection when not in use, and comes in a range of colors to match your spa cover.